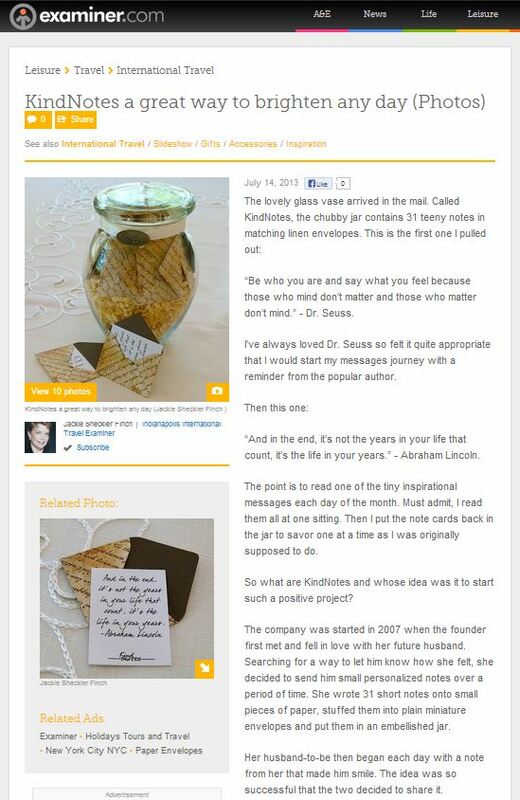 Congratulations to our Client KindNotes for their feature on examiner.com! KindNotes makes it easy to brighten someone’s day!Â Each KindNotes starts with a beautiful decorative jar that is then filled with 31 linen cardstock envelopes, each carrying inside its own message of love, inspiration, friendship, and more. Instead of enjoying only one day filled with surprises, they can experience a whole month or more. KindNotes can be given to friends, family, and loved ones — even employees and co-workers – as a way to warm their hearts, especially on the not-so-good days when they need a little cheering up. Words have a tremendous amount of power, and sending a gift that can be read again and again is a reminder that someone is thinking about them. When selecting the perfect KindNotes jar of messages, you can choose a specific theme or select from the KindNotes library which offers more than 500 messages. For an additional fee, you can also have the messages handwritten by KindNotes. You can also choose to put more of a personal touch to your gift by selectingÂ blank papers to create your own personal messages for the recipient. With KindNotes, you can send a smile to your loved one or friend each day of the month and let them enjoy the sentiment of opening an old-fashioned letter in the midst of modern-day technology and emails! Find out more at KindNotes.com!